Use the search box below to see the list of all good hotels in Gangtok in various categories including budget, 2-star, 3-star and even 5-star properties. It will show you rates, amenities, review scores etc. Select one and book at attractive low rates. This service is provided by world's no.1 online hotel booking site. You can also change the destination in the search box and find hotels in any other place. Gangtok is congested with hotels of all types. However there are also many trash hotels in disguise to take advantage of this opportunity. While some hotels have outstanding views of the snow mountains, some only claim such views while offering a fractional or partially blocked views due to the buildings ahead. Some might claim to be only few minutes from the town center, however that few minutes may be too much for a city dweller requiring grueling uphill climb. So how do you go about it? Below you will find my assessment of several nice hotels in Gangtok of different categories. Category Budget: Rs. 1600 - Rs. 2,200 per night. Category 2 Star: Rs. 2,200 - Rs. 4,000 per night. Category 3 Star: Rs. 4,000 - Rs. 6,000 per night. 1) If you are looking for a budget hotel within walking distance of MG Road, then Sagorika can be a good choice. But don't go with huge expectations. It's after all a budget hotel but tries to maintain itself at the top end of its own category. From outside the building doesn't look impressive at all. But inside it's quite nice and clean. 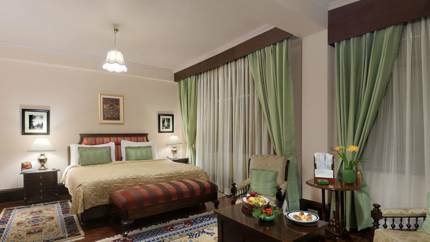 2) Most rooms are well maintained and quite spacious. 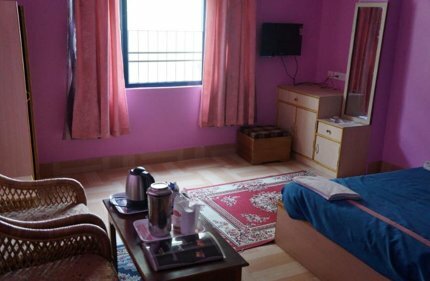 The rooms come with all standard amenities like attached bath with showers & geysers for hot & cold water, double bed, TV with cable channels, sofa with tea table, wardrobe, dressing table etc. The Deluxe rooms have additional amenities like daily news papers, shaving kit, shoe shine, dental kit, sleepers, tea/coffee maker etc. In winter you will need to get room heaters at extra cost. 3) The staff, particularly the manager is quite friendly. The hotel offers 24 hours room service. The service can be a bit slow though when the hotel goes full. 4) They have a in-house restaurant. Although the choice of food is limited, they do make decent North Indian food. They can serve food in the rooms as well. 5) The hotel offers free wi-fi. However towards the top floors the signal gets weaker. 6) Other facilities include 24-hours front desk service, travel assistance (charges are reasonable), taxi service, daily house keeping, EPABX, laundry, wake up call, car park etc. 7) Note that there are no views from most rooms. In fact most rooms overlook a dingy road. You should not choose this hotel if you are looking for views of the snow peaks, although the terrace rooms at the top floor offer nice view of the town and mountains. Even some rooms in 4th floor offer view of the town. But there is no elevator in the hotel and you will need to climb up the steep staircase for the upper floor rooms. 8) If you want to stay close to the front desk and don't want to climb many stairs, then choose a Deluxe room most of which are in the first floor. 9) One disadvantage of this hotel is the steep road that leads to MG Marg (the main town center and shopping & restaurant area). Although MG Marg is about 10-12 minutes walk from the hotel, the gradient of the road can make one tired. It's definitely not meant for the old people. However from just outside the hotel you can get shared taxis (Rs. 10 per person) for a drop at MG Marg. The taxi stand is nearby. While returning either you can walk or take a taxi. 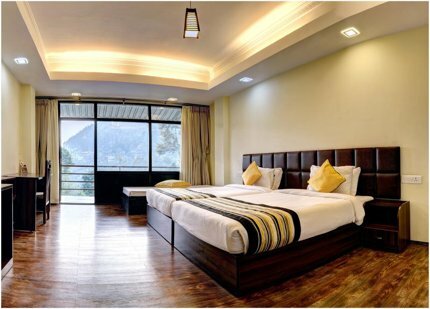 This is a nice value for money budget hotel in Gangtok. However it's located in the Development area and you will need a taxi to come to MG Road (the town center). It's only five minutes drive though. There are ample taxis available to go to MG Marg - both shared and reserved. 13 rooms are spread across 4 floors. There are economy, Super Deluxe (double) and Royal Honeymoon rooms. Try to take a room in the 3rd or 4th floor (301, 401 etc) and you will get great views of the mountains. There is also a nice open terrace on top with marbled floor with plastic tables & chairs laid out. The terrace also offers a sweeping view of the mountains. The rooms have standard furnishing including cable TV, attached bathrooms with geysers (the costlier rooms have bath tub as well). The staff and the manager are quite friendly and helpful. The hotel has in-house restaurant. The food is okay but limited in choice. The hotel can also arrange sightseeing tours and transfers. 1) MG Marg which is the town center of Gangtok with shops & restaurants, is only 8-10 minutes downhill walk from the hotel. Walking back up may be a little tiring for some, but if you take it slow and easy, it's not that difficult. Alternatively you can take a taxi back to the hotel for a small fare. The location of the hotel is quite convenient while being away from the crowd. 2) The best part of this hotel is the view of Kanchenjunga peaks. All 20 rooms have great views, French windows and private balconies. The standard rooms however do not have private balconies or French windows. The rooms in the suite blocks are the best. 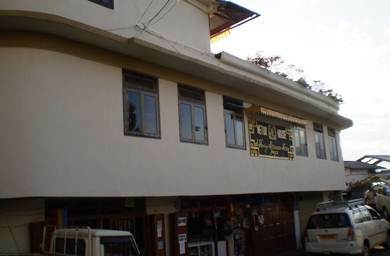 3) Rooms have nice amenities including rotating room heaters (very useful during winter), large attached bathrooms with its own view window, geysers in the bathroom, intercom phone, TV with cable channels, wooden floors and wall paneling, tea/coffee maker etc. The standard rooms have few lesser amenities. Rooms are quite spacious too and well maintained plus clean. 4) Very friendly staff and the service is quite prompt as well. They offer 24hours room service. 5) The restaurant adjacent to the front desk is nice. The food variation & quality is quite good. 6) They have newly opened a resto bar (Pub-5) located next to the restaurant. However I see it seldom used other than by few in-house guests. Last time I was the only one in the bar. 7) The Front Desk makes travel and tour arrangements at very reasonable prices. I remember on one occasion they arranged a vehicle (Scorpio) for me to visit Tsomgo lake and Nathula pass, and the rate matched with the market rate. 8) Other amenities include complimentary wi-fi (although it did not work in one occasion), car park, power backup, a wonderful terrace viewing deck where you can take your breakfast, lunch or dinner (although a board here asks you to vacate the place by 9pm so that room guests are not disturbed), house keeping and laundry service, conference hall for 50 etc. 9) Come of out of the main lobby, turn left and you will see the adjoining shop selling Aloo Chura, a popular street-side snack in Gangtok. Don't miss that. You will find loads of locals and school children having that. It's a kind of Aloo chat mixed with chana ... tastes delicious. Tibet Road, Gangtok- 737101, Sikkim. 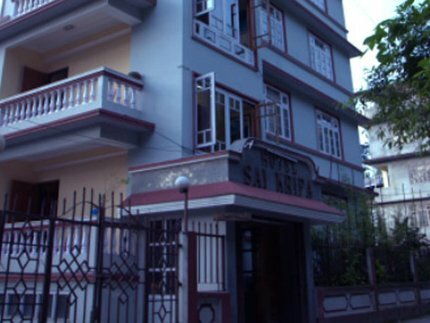 This is a nice hotel with 17 cozy rooms across three floors and located at the Development Area of Gangtok. It's located about 20 minutes walk from the Center of the town (M G Marg). 1) Other than non-view rooms (which I don't prefer), they have several types of valley view rooms including rooms for couple, and suites that can accommodate a family of up to 5. The view rooms offer excellent view of the Ranka valley, Rumtek hills and on a clear day, glimpses of Kanchenjunga. View of sunset from the valley view rooms is amazing. The terrace rooms have a roof covered common terrace with excellent views of the valley and mountains. There is no elevator in the hotel. 2) In-room facilities include attached bath (although small) with geysers, TV, tea/coffee maker, phone, room heater at additional cost etc. Suites additionally have hair dryer, mini bar etc. All rooms are clean. Free in-room wi-fi is provided but it is unreliable and can be very slow. So do not rely on that. 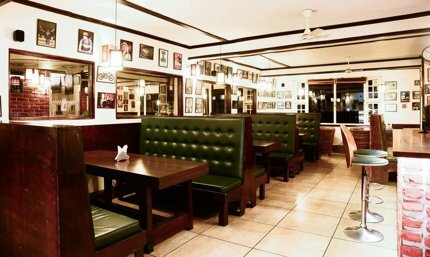 3) There is an in-house restaurant at the basement serving Indian and western food. The buffet breakfast spread is okay but vegetarian (including juice, fresh fruits, bread, butter, jam, cakes, chole/baturey, south Indian dishes like idli, vara etc. However you can get eggs, ham, bacon etc on request at no extra cost. Overall food served by the menu is good. But they take a while to deliver. The restaurant closes by 9pm. There is also a in-house bar serving spirits, beer etc. 4) The hotel offers travel desk to arrange for your tours, required permits and transfers. SBI ATM and a convenience store are located in the same building. Taxi stand is an easy walk. 5) The service is friendly. Although overall it's a nice hotel, in my view the price is on the higher side. MG Marg is about 20 minutes uphill walk from the hotel, so it can be difficult for the elderly. There is a school nearby, so during the day time it can get a bit noisy. 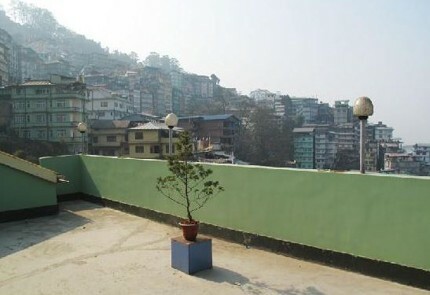 Jiwan Theeng Marg, Development Area, Gangtok – 737101 Sikkim. 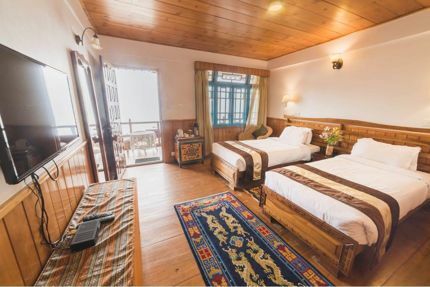 If you want to enjoy a hotel (originally a family house) with traditional Sikkimese architecture, warm hospitality of staff & other members, and beautiful view of the mountains from your room, great home cooked local dishes, and all that at reasonable prices, then Netuk House can be the answer. The hotel is located on Tibet Road and about 100 yards below Hotel Sonam Delek. M G Road is an easy downhill walk of about 6-7 minutes from here. This family house was constructed in 1950s by Gellong Netuk Lama, who was an affluent man, a great politician and executive counselor to the King of Sikkim. 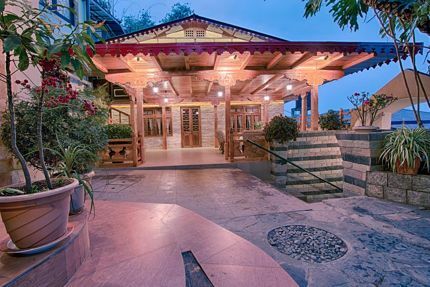 In 1990s the house was opened to tourists and guests so that one could enjoy the traditional Sikkimese charm. It originally had only 4 rooms in the main block. Later a new block with additional 6 rooms were constructed. 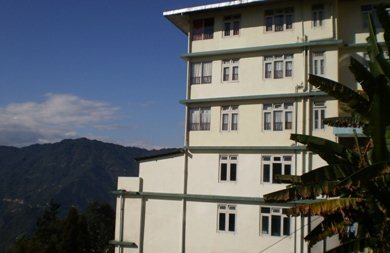 The rooms in the Main Block have color themes like pink, blue, green etc, while the ones in the New Block (constructed in late 1990s) have private balconies with lovely view of Kanchenjunga. 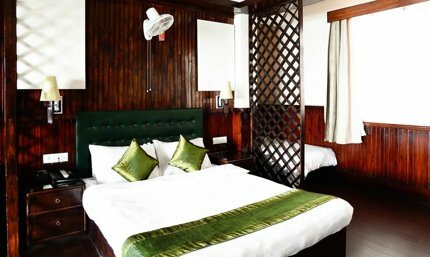 All rooms have Sikkimese interior finish including traditional wooden tables (Choksay) and ceiling with Sikkimese art work. The hotel is clean and very well maintained. One of the great attractions here is the open terrace with wonderful view of the mountains including Kanchenjunga. The hotel has an in-house kitchen. You get delicious home made local dishes including hot momos as well as fusion dishes. You will be surprised to see so many innovative local dishes here and come to know that even orchids can be used in great food preparations. You should order your food in advance. Another great feature is the continuous supply of hot Temi tea - great way to keep yourself fresh and warm in cold mornings and evenings. The hotel has an in-house bar. Other than standard drinks, it also offers a Sikkimese drink known as 'Chaang' - a millet beer which is served in traditional bamboo container with a bamboo straw. The hotel also offers free wi-fi. This is another great value for money mid-range hotel in Gangtok. It's a family run hotel and you can expect clean and well maintained rooms. It's located next to the State Assembly and only 5 minutes walk from MG Marg which is the town center with activities, shops and restaurants. The hotel has 18 rooms - Standard, Deluxe and Super Deluxe. 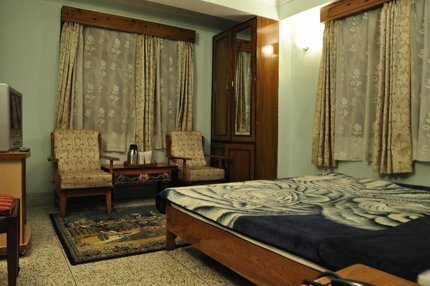 The Super Deluxe rooms have nice private balconies and you can enjoy lovely view of Gangtok township and mountains from there. Rooms have standard furnishing, quite spacious, attached bath with geysers, cable TV, direct dial phone etc. Other services include laundry, ironing board with iron, room service, house keeping, travel desk, car park etc. However the in-house restaurant serves only vegetarian food, but there is enough variations in that including in breakfast. Food quality and taste is really good, I especially liked the South Indian food here. They also serve Jain food. 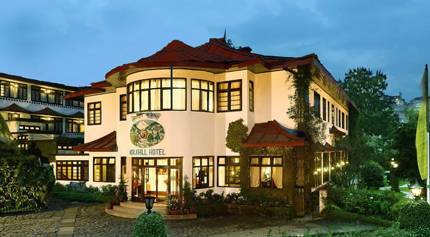 If you want to stay right on MG Marg centered at the main hub of Gangtok and surrounded by shops and restaurants, then you can consider The Oriental Hotel. There is nothing special about this hotel. If I may describe it in few words - it's a simple mid-range hotel which blends traditional and contemporary charm. The first floor lounge is nice and has sofas and choksays (wooden Sikkimese tables). There are 6 floors with 16 rooms and 4 suites. Take rooms that overlook the MG Marg promenade and you can enjoy the scene from your room and through the window. The suites are in the upper floors. The Penthouse Suite in the top floor is excellent. In the top floor you also get a lovely terrace. The upper floor rooms also have nice views of the mountains. But note that there is no elevator in the hotel. So choose your floor according to what may suit you. While the room furnishing is standard, the bathrooms are a bit small. The hotel has an in-house dining room which overlooks the MG Road. The food served is nice. The rate includes bed tea and breakfast. While there is no buffet, they make breakfast to order and serve it on the table. The staff are friendly and helpful. However due to the central location of the hotel, the rates are higher compared to other hotels in the same category. 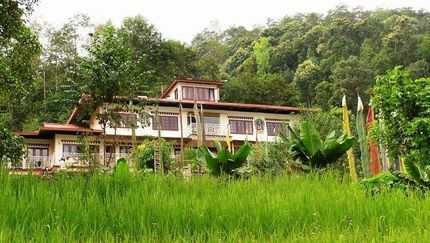 Located at Rumtek (about 45-minute drive from Gangtok town), this is a wonderful boutique hotel set up in 3-acre paddy fields and bamboo groves with wonderful views of the mountains around. There are 15 well appointed rooms and each has its own unique decor with attached western style toilet. Rooms have free wi-fi. Both the exterior architecture and interior decor reflect traditional Tibetan style. There is a wonderful meditation room in the top floor complete with traditional Buddhist altar and windows with great views of the nature & mountains.... this is ideal for yoga or meditation, you can also take lessons in meditation here. There is also a room for herbal bath. The service is very cordial and homely. You can have authentic Lepcha platter at the restaurant here other than Indian and international food. They also have a bar.... try the local millet beer served on a bamboo cup with a bamboo straw and known as Chang. There are other local brews as well like Dansberg beer which is produced in Sikkim. The hotel organizes guided nature hikes and day tours to Lepcha village, monasteries, Tsomgo lake & Nathula pass etc. 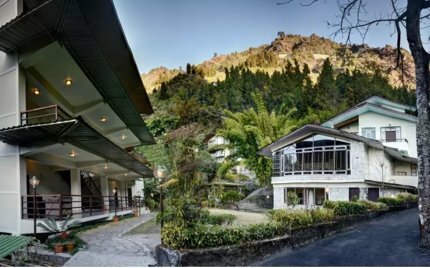 This beautifully landscaped resort is in Rongay upper Gangtok and its pottery, shrubbery and lovely design sensibilities will blow your mind at the first glance. There is a playground, shaded canopies with chairs, activity center, restaurant-bar and bonfires are arranged on request. There is a small spa “Meta” which has only one though competent masseuse. The breakfast spread is good with everything from idli to poha to sandwiches and cakes and fruit….mostly breakfast is complimentary and the staff is nice enough to allow guests to carry loaded plates to their favorite places in the lawn. Didn’t get to explore most of the items in the menu but the overall quality of food was good including the Summit special rice that comes with complimentary chicken. Service is courteous but not prompt…it was disappointing to get up in the morning and see used plates still lying outside the door. Some of the staff are courteous but lack the warmth and friendliness that one usually associates with the hills. The front desk staff Namrata and Sudhir were nice and courteous. This is a 3 star hotel that charges around 5000 INR to 7000 INR for premium and chalet rooms respectively. Rooms have coffee maker, king sized bed, wardrobe, shoe racks and a nice LCD. There is also a balcony with lovely seats and table and the bathroom has a bathtub and Biotique toiletry kits. The Chalet rooms are bigger and have an in room bar. On the flip side there is also Wi-fi though that hardly works and there is a security guard who is mostly absent. The entrance to the hotel is on a steep downhill slope and it was difficult walking back up. Overall a nice experience with the look and feel of an eco-retreat….the beauty of the grounds is enough to make up for any minor issues. We had a nice time there and would recommend this place to people looking for a quieter accommodation version of Gangtok. 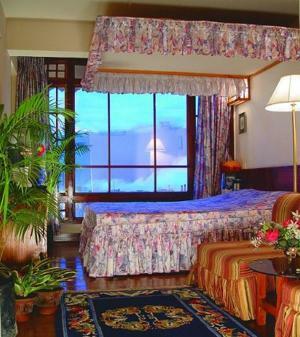 Located centrally in Gangtok, this hotel is all about the old royal Sikkimese grandeur and charm. The property was originally built in 1932 by the King of Sikkim as a guesthouse for dignitaries and other royal guests. However additional constructions have subsequently taken place including a new wing to offer more rooms & suites. It is a heritage property and reflects the grand aura of the old world. As you enter the lobby, you will be awestruck with the interior designs and the furnishing ... Burma teak wood of the period, oak floor boards & paneling, fireplaces, grand piano and plush sofas all reflecting the aura of Sikkimese royal hospitality during the British colonial era. Many prominent dignitaries and even Hollywood celebrities like Shirley MacLean and Michael Douglas stayed in this hotel. There is a small but a lovely and well manicured garden in front with sit-outs where you can relax at the end of the day or enjoy your afternoon tea. There are 25 rooms and suites in the hotel. However the rooms in the main building are more spacious and have great vies. Most of the rooms in the main building overlook the large soccer stadium nearby, and the valley with mountains in the backdrop. Several rooms here have good view of Kanchenjunga snow peaks as well on clear days. 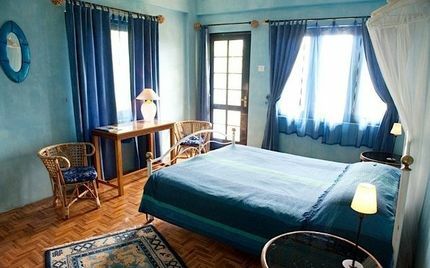 All rooms have Burma teak flooring, king or twin beds... the suites additionally have a living area. Rooms are equipped with LCD TV, safe, wooden cupboard, mini bar, tea/coffee maker, free WiFi, attached bath with designer toiletries, bath robes, slippers etc. However several rooms in the new building are relatively smaller and look crammed. Bathrooms are small too in most rooms in the property. The geysers in the bathrooms being small as well, you need to use the hot water sparingly and can not really use the bathtub. The in-house dining room looks quite elegant. There is a set buffet. However the food is mostly north-Indian type and you will hardly find any variations (may seem a little repetitive if you stay here for several nights). Some western and local variations would have been nice. The food is quite okay though. The breakfast spread is quite good and includes Indian items like paratha, idli etc among others. There is a nice & elegant in-house bar with impressive stock of spirits and wine. There is a nice in-house library. The spa offers Swedish massages, facials etc. The hotel staff are quite friendly and helpful, however they seem to be living in their own world at times and can be seen chatting with each other. The stadium being quite near the hotel and full with daily activities and practices, it can get little noisy at times. The hotel has ample car parking space. The town center MG Marg is about 10-minute uphill walk from the hotel where you will find all kinds of shops and restaurants. Address: Paljore Stadium Road, Upper Sichey, Arithang, Gangtok. 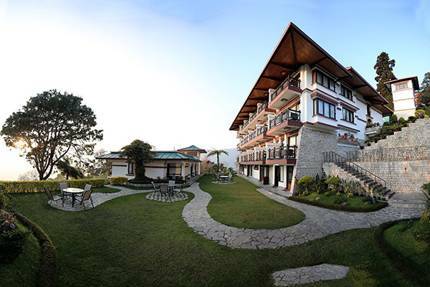 This is a great 5-star resort in Gangtok and located about 10kms away from the town center. This means you are located at a calm & quiet place, in a land of its own with lush garden setting and surrounded by mountains. In fact the entire property is set up on a 48-acre forested land. The resort has been designed based on monastic and colonial architecture. The moment you enter the premises through the driveway, you get to feel the grand aura. It has several rooms, family rooms, cottages, suites and different types of villas. I like the rooms with private balcony and sit out. They are very spacious and of course all rooms have great interior finish. All units come with free basic Wi-Fi (high speed wifi is chargeable), tea/coffee maker, safety locker, TV & DVD player, hair dryer, Minibar, Bottled water etc. Other complimentary facilities in the property include fitness center, swimming pool, yoga, table tennis, pool table, kids play area etc. The hotel has several dining options including in-house restaurants, cafe, lounge, bar and pool bar. The restaurant Orchid serves Indian, Pan Asian & Continental Cuisine. Rumtek Lounge is so named because of its marvelous view of Rumtek Monastery and surrounding valley. This is a coffee/tea lounge. If you are looking for local Sikkimese food, this go over to Jungle Cafe. It also has a bakery. The in-house impressive spa offers face therapy, body massages, skin treatment, pedicure & manicure, salon services etc. The spa has eight therapy rooms. One of the unique features of the property is its large live Casino - Mahjong. There is an entry fee (quite steep) which includes few drinks, complimentary playing chips and set meal. The casino is open 24 hours and allows outside guests as well. It has a separate entrance. Other than Slot Machines, there are roulettes, Baccarat, Black Jack, mini flush, and several other games that you can indulge on. However the casino itself is relatively small and does not have poker tables. This is another great family owned heritage property located on a hilltop and near the Governor's House. The owner Thinley Namagyal Denzongpa is a very knowledgeable and courteous man and inherited the property from his great grand father. 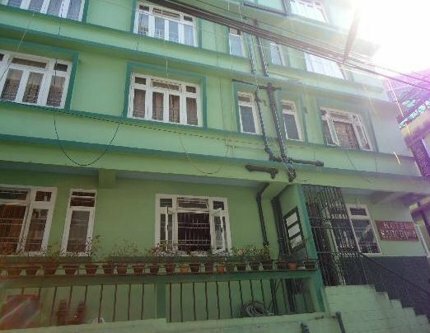 It's located in a walkable distance from the Gangtok town center (MG Marg is about 1km), so it's quite centrally located yet away from the touristy areas offering you tranquility and wonderful views of mountains and valley. There are several buildings in the property housing a total of 25 rooms, suites and regency suites. 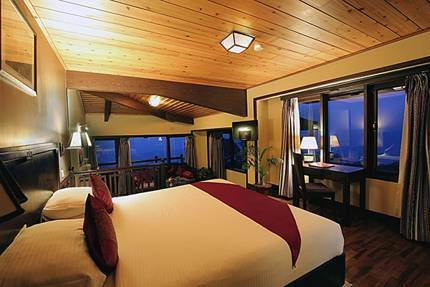 All units have private balcony and most offer wonderful view of Kanchenjunga snow peaks on a clear day. The entire property and rooms are exquisitely designed, wood paneled and spotlessly maintained. You have a choice of king bed or twin beds. Rooms are quite spacious (take rooms on upper floor for good view) and beds are very comfortable. Room amenities includes LCD TV, Wi Fi (although the connectivity is intermittent), electronic safe, minibar, tea/coffee maker, iron & ironing board, personal weighing machine etc. There are also fire places in the suites. The private balcony is ideal to take morning tea while listening to chirping birds. One room in the property is dedicated to persons with disabilities. Bathrooms come with biotic toiletries. 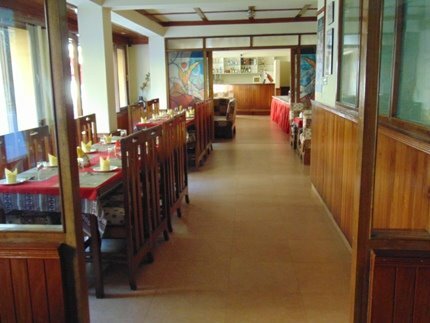 There are two dining rooms offering Indian, Continental and Sikkimese cuisine. The food is good and the breakfast spread is quite nice. You can get excellent vegetarian food here. There is an in-house bar that can seat 30 persons. The in-house fitness center is also well equipped. Enough car park is available. The property has a landscaped garden in front with sit-outs. This is a great place to have your afternoon tea. There is also a Kanchenjunga viewing stand at the property. There is a casino attached to the property which operates independently. This offers a nice nightlife option. All staff are very courteous and cooperative. Service is excellent. They organize sightseeing tours and transports. 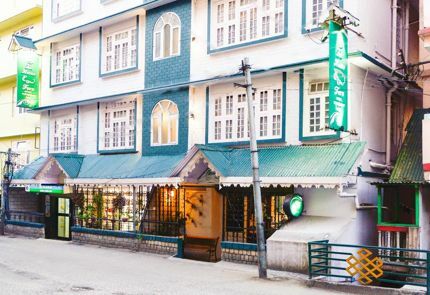 We stayed 3 nights at Lemon Tree, Gangtok in April 2019. A comfortable Hotel. A number of rooms facing the hills and the valley and also with a balcony. Ample lay out at the buffet. Though not near to MG Road (heart of Gangtok). But you can take a taxi from the Hotel, for Rs 100 per side. We even called the taxi for the return to the Hotel from the market and he did turn up to pick us up. Hello, Your suggestion was just bang on as per my requirement for Darjeeling Hotel. Need help for Gangtok Hotel. Mid range hotel preferably within 4000+(max). Away from hustle bustle, not very far from MG marg and room obviously with a view. Last time you suggested Central Nirvana for Darjeeling it was awesome experience. And I can keep thanking you and your team for the same. 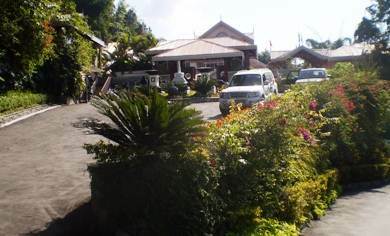 Try Hotel Sonam Delek, see the hotel review on my site. Golden Crest is a relatively new and a good budget hotel. However you need to note that it is not really in a walking distance from MG Marg (the town center) ... about 2kms away, and the restaurant offers vegetarian food. Service is good, the location otherwise is convenient (near the Ropeway), and rooms are all equipped with modern amenities. 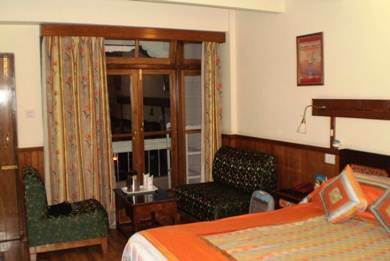 Good value for money if you are not looking to stay on or in close proximity to MG Marg. I can comment about Club Mahindra resort in Gangtok. It's a nice all inclusive resort with its own restaurant, bar, activities & tours. It's got lovely views of the mountains from the room balconies. The food is also quite good. But the resort is quite far away from the town and quite isolated. You will need to depend on the resort's own travel desk for all sightseeing, which won't be quite economical if that's a main consideration. However, if your membership and therefore lodging is already paid for, it makes sense to stay there. Equivalent lodging in Gangtok town will be quite costly. If you like to stay close to the town center (MG Road etc which is the best place to spend the evenings), consider one of the suitable hotels that I have reviewed in my site.